My dad gave me a copy of the cookbook Jerusalem for Christmas. Now I want to go to Jerusalem. Okay, so that’s not happening any time soon. Anyway, the ingredients and recipes that arise out of such a fascinating mix of cultures are alluring. I’m at least going to buy a jar of za’atar spice mix and a bottle of pomegranate molasses, neither of which I’ve had in my pantry in years. (And I learned that fresh za’atar is actually hyssop, which technically, we could grow and dry here). Coincidentally, I’ve had 2014’s vegetable darling, cauliflower, on the brain. (For some reason, the endless lists generated by the food trend police all seem to mention cauliflower, as if it hadn’t had a full and happy life before now.) For me, I just naturally think of cauliflower in winter, when it’s snowy and 8 degrees outside. I guess it’s the winter white thing. Hence, I can gladly offer you a collection of cauliflower recipes I’ve put forth in winters past (see links below). Once again, the winter darkness conspired against me to shoot a decent photo in natural light, but you’ll have to trust me on this one. 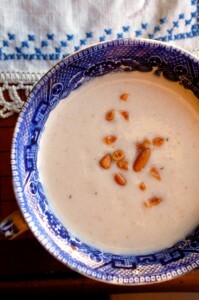 The soup is lovely—comforting and pleasing enough for most to enjoy (even Roy). I had it for dinner with an avocado and arugula salad. Yum. Quick farm report: Chickens are hanging in there. Feral cat has baby kitten housed in former pig pen. Roy is leaving food for them. Farmer wants to adopt kitten. Will keep you posted. Let’s all hope for warmer weather. Mice are in hiding. I added a teaspoon each of ground cumin and ground coriander to this soup, but you could replace a little of the cumin with ground ginger or go with just garam masala. You could also add some heat anyway you like. Instead of the yogurt and lemon juice, you could finish this with coconut milk and lime juice. In a large (6-quart) Dutch oven, heat 1 tablespoon of the butter and the olive oil over medium heat. Add the cauliflower pieces and 1 teaspoon salt. Cook, stirring only occasionally (to let browning happen), until all the cauliflower pieces have got some bits of golden browning on all sides (they’ll be less stiff, too), about 12 to 14 minutes. Add the remaining tablespoon of butter, the fresh garlic and ginger, and stir until fragrant, about 1 minute. Add the cumin and coriander and stir well. Add the chicken broth and the water and stir well to scrape up the browned bits stuck to the bottom of the pan. Bring to a simmer, cover loosely, and cook for 15 minutes. Remove from the heat and let sit for 10 to 15 minutes. Meanwhile, get out your blender and a dish towel and set a large heat-proof bowl by the blender. Put 1/3 of the soup plus 1 tablespoon tahini in the blender. (For safety reasons, you don’t want to fill the blender too much.) Cover the lid with a dishtowel to prevent splattering, but keep a small vent hole open. Puree until smooth. Transfer to bowl. 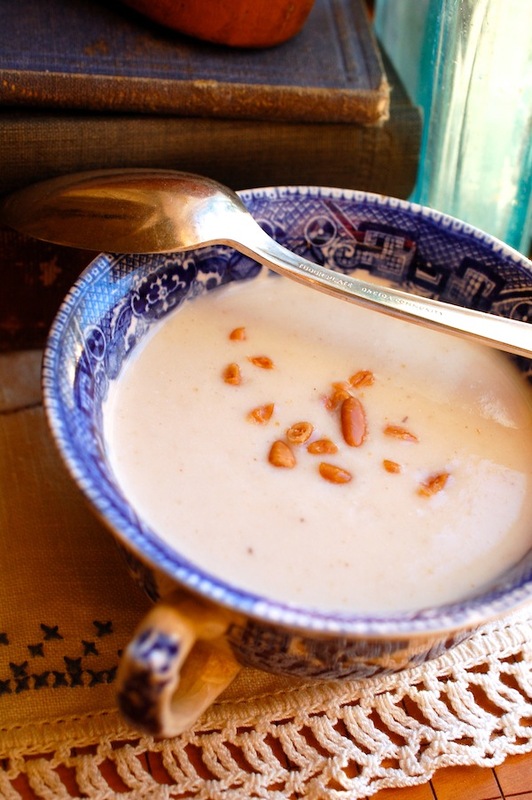 Repeat with two more bathes of soup, adding 1 tablespoon of tahini to each batch as you puree, and transferring each batch to the bowl. Rinse the Dutch oven and add the pureed soup back to it. Put the pot over medium-low heat and whisk in the yogurt and 1 teaspoon lemon juice. Let the soup get a bit warm, then taste it for salt and lemon, adding more of either if necessary. Continue to heat, stirring frequently, until hot enough to serve. Note: In an effort to streamline this recipe, I didn’t even start with sautéing onions (probably a first for me), nor did I roast the cauliflower first, which I really wanted to do. Instead I browned the cauliflower in the Dutch oven, added the fresh aromatics and spices, covered, and simmered. 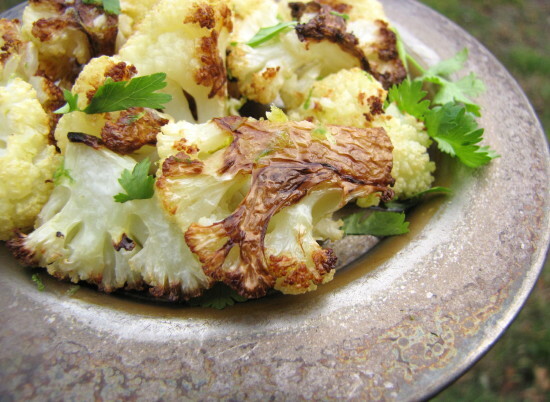 If you did want the added flavor that roasted cauliflower would bring, you could do that (and sauté some onions while the cauliflower cooks), but you will probably want to go with a little less liquid (maybe 5 1/2 cups instead of 7), since the cauliflower will be a smaller volume. Well, there is no antidote to all this other than good warming winter food. (And chocolate—I have my new favorite, a 77% percent cocoa bar from Chocolove, by my side.) 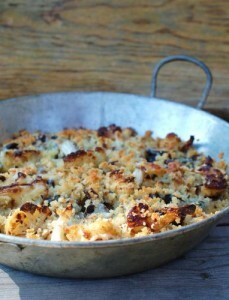 In the kitchen today I am making a cauliflower gratin, because I am still having cruciferous cravings. Don’t worry, I am not eating the chocolate and the cauliflower at the same time. Anyway, the version I made today is just cauliflower and mushrooms. I call it a gratin but really it is more like gratinéed veggies. 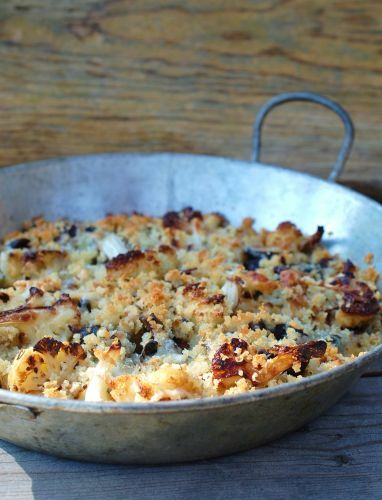 No major deep-dish casserole-y kind of thing here—just roasted veggies sprinkled with cheese, a little cream, and plenty of breadcrumbs and baked until bubbly. Rustic and delicious. The rosemary winds up being pretty fragrant, so sub in thyme if you’re not in a piney mood. *P.S. I wrote this yesterday but was unable to get it posted until today. I am happy to report that Auntie Em and Toto did not fly by the window. However, one of the doors off the gas grill, some tree limbs, and a plastic tarp are all tangled up outside my window. Take this idea and run with it—use whatever roasted veggies you like, sprinkle with a bit of cheese, cream, and breadcrumbs, and bake until bubbly. In a small bowl, combine the breadcrumbs, 2 teaspoons olive oil, 1/2 teaspoon chopped rosemary and a pinch of salt. Mix well and set aside. 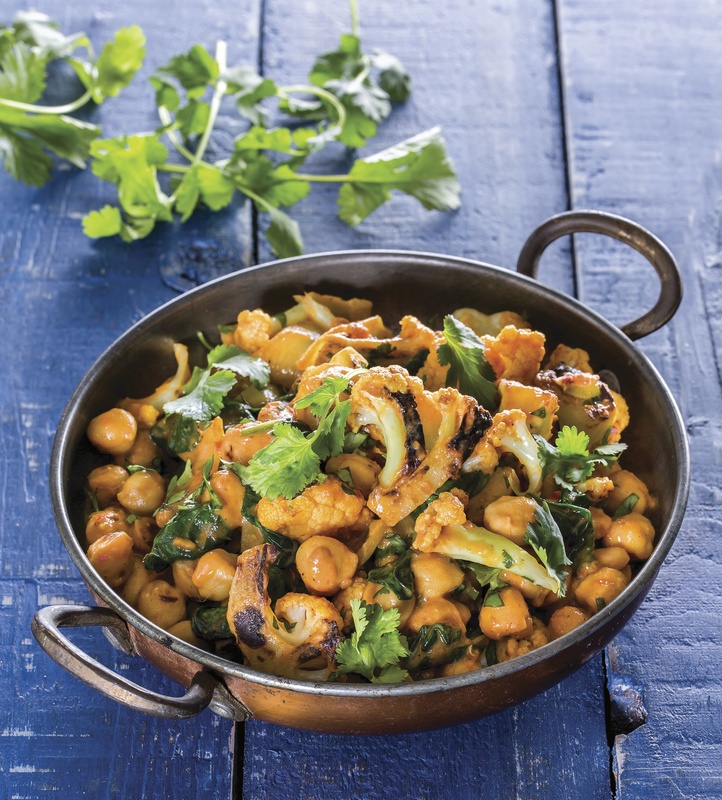 In a mixing bowl, toss the cauliflower and mushrooms with the 3 tablespoons olive oil and 1/2 teaspoon kosher salt. Spread the vegetables out in one layer on the sheet pan (flip the florets so that they are cut-side down). Roast until the veggies are nicely browned and tender, about 28 to 30 minutes. Let the veggies cool for a few minutes and transfer them to the baking dish, arranging them in one snug layer. Reduce the oven temperature to 425°F. Sprinkle the remaining rosemary and the cheese over the vegetables in the pan. Drizzle the cream over the vegetables. Scatter the breadcrumb mixture over the top, leaving some vegetables peeking out. Bake until the crumbs are well-browned and the cream has bubbled and reduced, leaving a thin brown ring around the edge, about 18 to 20 minutes. Serve hot or warm. Guess I am a little late to the party. 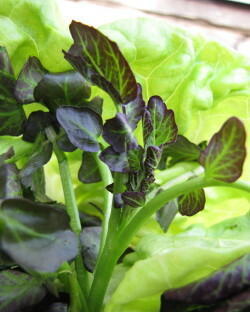 Here I have been thinking I have some extra-special arugula-growing talent, because mine is still alive in the garden in late January. (Yes, and I’ve reminded everyone of this in nearly every recent blog.) And never mind that it’s been incredibly mild this year—we had 8 inches of snow on Saturday, so now we can officially call it winter. (Though it’s already back up to 45 degrees!) 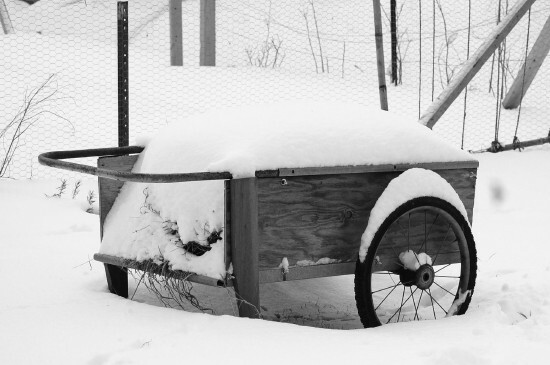 I got a huge kick out of digging under the snow (and the row cover) on Sunday to find the arugula still percolating away underneath. But it turns out that I don’t have a special talent—apparently arugula is about the heartiest green you can grow. And with just a little protection, you can keep it going through the coldest months around here if you give it a good head start in the fall. 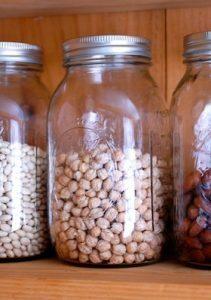 It will do most of its growing before December, but if you’ve planted enough, you can just keep harvesting it all winter. This is a very exciting concept for me—having salad greens all year ‘round. 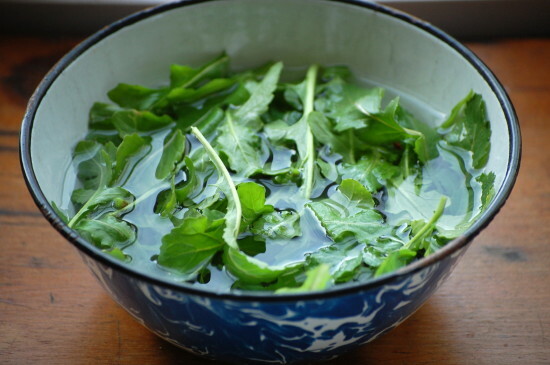 The arugula was more or less an accident this winter, but come this fall, I’ll deliberately plant mâche (also called lamb’s lettuce—mild, nutty, and delicious) and spinach, too, for winter harvesting. Right now, though, I am eating arugula with everything that will stand still long enough. Today that meant roasted cauliflower, which I’ve been craving something bad. I’m not sure why, though I do have a thing about winter whites. I love the color white (I collect Ironstone dishes) and when the snow started falling, cauliflower and endive and baby turnips and pearl onions began floating through my mind. I finally bought a head of cauliflower today, and decided to pair it with something bright and zingy. I love citrus with veggies this time of year, and I remembered a great dressing I put together for a carrot salad (of all things!) in Fast, Fresh & Green. It stars one of my favorite ingredients—crystallized ginger—along with lemon zest, lemon juice, and orange juice. 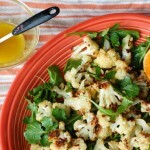 Just the combo to counter the intensely sweet, nutty flavors of roasted cauliflower. So I gave it a go. 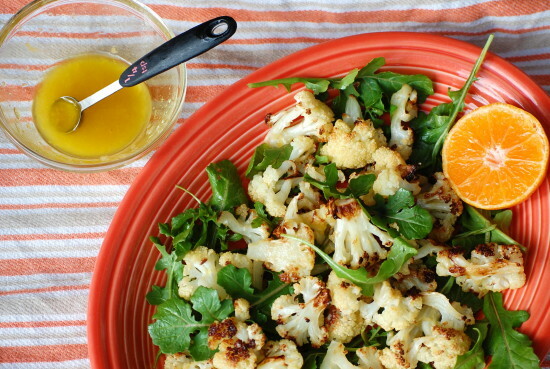 Turns out the dressing is terrific with cauliflower—but even better with arugula. (I used the greens as a bed for the roasted veggies). 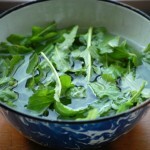 So I will use the dressing again with hearty winter green salads. But the cauliflower combo was just right today—a bright spot on a cool (not exactly cold) winter day. 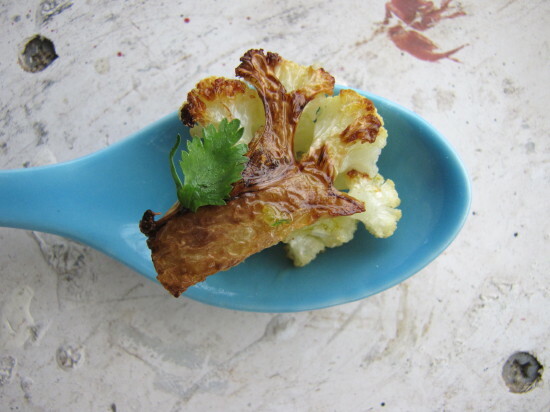 For another way to dress up roasted cauliflower, see the compound butter idea in this post. You will probably not use all of the ginger dressing—save any extra for a green salad. In summertime, the dressing would also be a great marinade for shrimp before they hit the grill. A few toasted chopped almonds would make a nice addition to this dish. 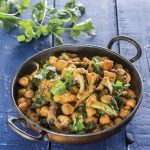 You could also pair the whole thing with some cooked whole grains, such as wheatberries, farro, or brown rice, to make a delicious vegetarian main dish salad. Combine the olive oil, the ginger, the lemon juice, the orange juice, the lemon zest and the salt in a small bowl and whisk well. Re-whisk before dressing. Store any leftover dressing covered in the fridge. I’ve always been a sucker for colorful vegetables. But hand me another dark, drizzly day, and you’ll find me going gaga at the grocery store for anything chartreuse…or fuchsia…or sunset orange. I need the color to stimulate my senses. The other day I saw a cool display of red watercress—something I’ve never seen before—and lurched towards it without even thinking. 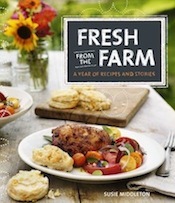 I brought it home and promptly mixed it with some pale lemony baby bibb (above right) for a delicious and pretty salad. That worked out pretty well. 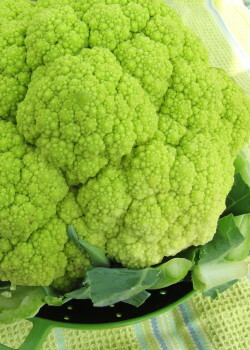 It turns out that Broccoflower® is a registered trademark of Tanimura & Antle, a produce company that brought the variety (a cauliflower with some broccoli genes) over from Holland more than 20 years ago. Tanimura & Antle also has an orange cauliflower they call “Fiestaflower.” Meanwhile, another big produce company, Andy Boy, has begun marketing green cauliflower, orange cauliflower, and purple cauliflower in the last few years under those basic names. (All of these are purported to have the antioxidants you’d expect would pair with those colors.) As far as I can tell, Broccoflower® and green cauliflower are virtually the same thing. Whew. I was getting a little worried that I’d have to take the new recipe out of the book. 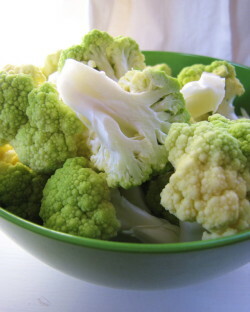 It’s not just the color of green cauliflower (aka Broccoflower®) that I love. To my palate, it tastes a bit less cabbagey and a tad sweeter than white cauliflower. And when you cut it, the stems are a bit firmer—more broccoli-esque. And in general, I think it holds up better in cooking. Its florets are firmer than those of cauliflower, which can get a bit crumbly. 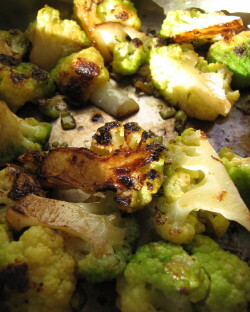 Green cauliflower caramelizes beautifully in the sauté pan or roasting pan, so if you find some, crank up the heat. Then treat it to lemon, garlic (or another allium like scallions or leeks), and Parmigiano—three flavors it loves. 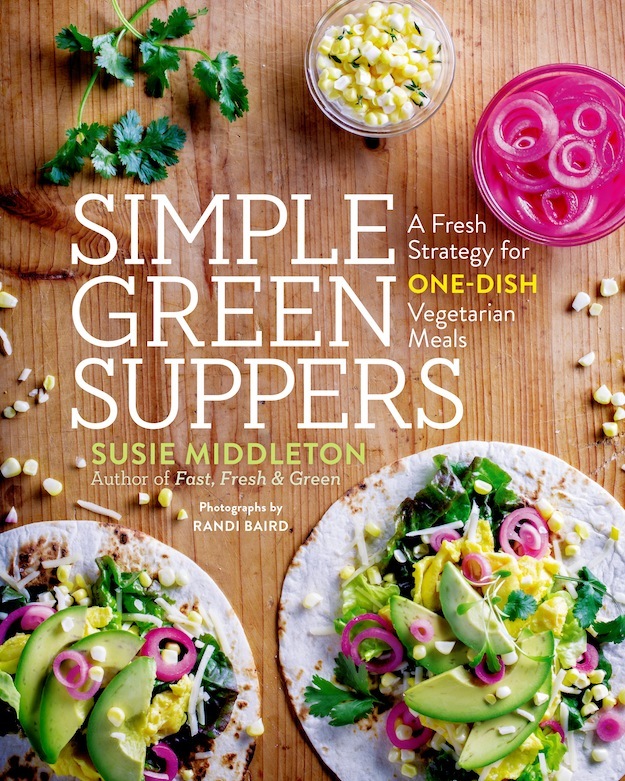 (I’ve included a sample side dish recipe, below.) Serve it with roast pork or chicken, or turn it into a pasta sauce with a little chicken broth or pasta-cooking water and more olive oil or butter. 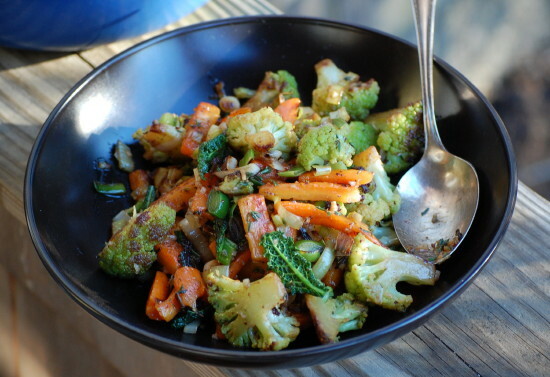 It’s pretty darn tasty, which shouldn’t be surprising—I find the most colorful veggies taste the best, too. For this recipe, cut the florets on the small side—no more than about 1 1/2 inches long. It also helps browning if you cut whole florets in half—that cut side will have maximum contact with the hot pan and get very caramelized (see photo). Feel free to adjust the amount of lemon (or add a bit of lemon zest) here. And if you want a slightly saucier dish, deglaze the pan (to scrape up the flavorful browned bits) by pouring a bit more chicken broth, water, or wine (diluted) in at the end. You can also enhance the sauce with a bit more cold butter. Uncover, carefully pour in the chicken broth or water and lemon mixture, and immediately put the lid back on (beware of steam). Cook until most of the liquid has steamed off or been absorbed, about 30 seconds. Uncover, turn the heat to low, and add the remaining tablespoon of butter, the remaining teaspoon of lemon juice, and the scallions. Cook, stirring gently, until the butter has melted and the scallions have softened, 1 to 2 minutes. 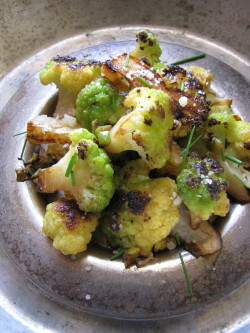 Remove the pan from the heat and transfer all the green cauliflower and scallions to a serving dish or dishes. Sprinkle with the Parmigiano and the scallion tops and serve. I started taking yoga again last week. Actually, “Yoga on the Ball.” At first it made me giggle, bouncing around on this thing. The ball reminds me of the Hippity-Hop I had as a little girl. Back in those days, my parents would do anything to try to wear me out. I was Miss Energy. These days, not so much. But after I got over the giggles, I started to feel really good. What I need (or what my back, my hamstrings, and my tummy need) is stretching, and draping yourself over, under, and around this big round ball seems to make stretching easier and more effective. Very Cool. 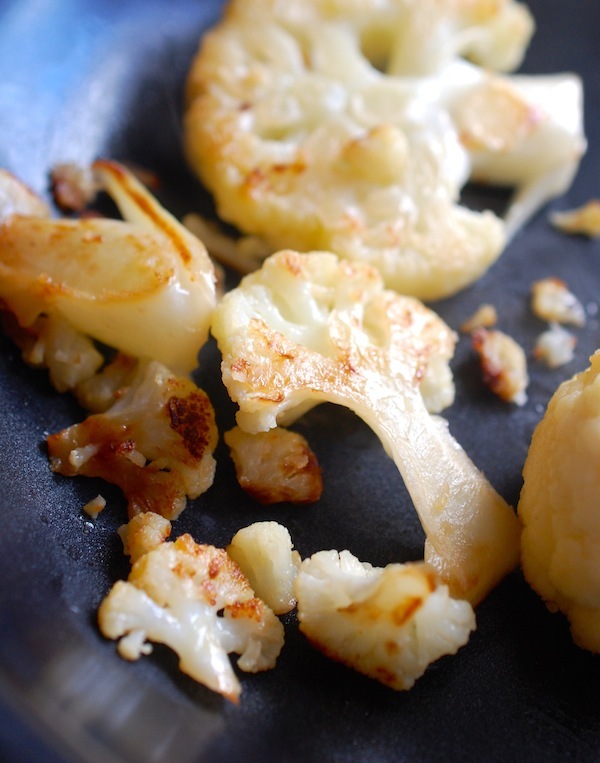 There is simply nothing difficult about roasting cauliflower. 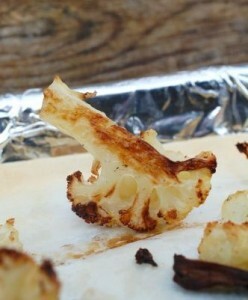 It’s not even hard to cut up a cauliflower into florets. 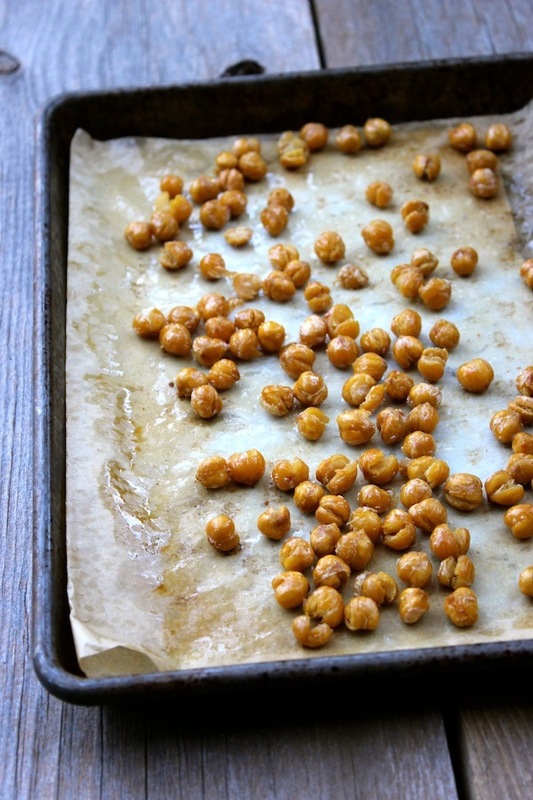 And with my quick-roasting method (yes, lifted right from Fast, Fresh & Green), you can be popping these yummy bites right off the sheet pan and into your mouth in less than 30 minutes. But in case you’d actually like to serve these as a side dish, I’ve included a little seasoning idea—a Garlic-Lime-Cilantro butter—with the method below. 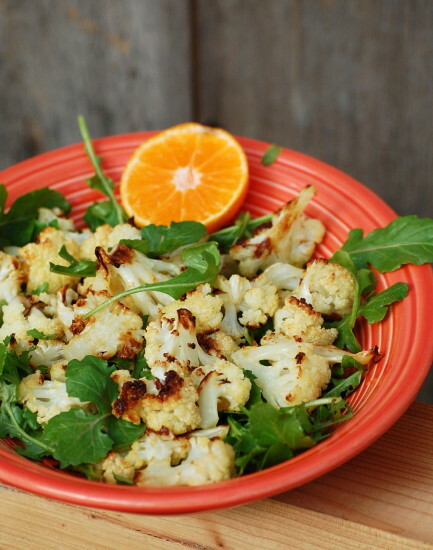 For more ideas, check out the Orange-Olive Dressing on the roasted cauliflower in FFG, or try one of the other herb butters in the roasting chapter. But I have to tell you just one last thing about M.J. and this whole yoga gig. The reason M.J. is so cool is not because she loves roasted cauliflower. It’s because she gives the best homework assignments ever. 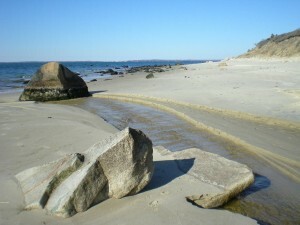 Last week she reminded us that we live on an Island and that we should visit the ocean if we haven’t lately. In fact she said, we should go to the beach, close our eyes, and practice pacing our breaths with the rhythm of the waves coming ashore. She even emailed us all this weekend to remind us of our homework. So today I got out of the kitchen and went to the beach. It just happened to be 70 degrees, and I got to dig my toes into surprisingly warm sand. I’m not sure I quite got my breathing in sync with the waves. But it was the best homework assignment I’ve ever had. 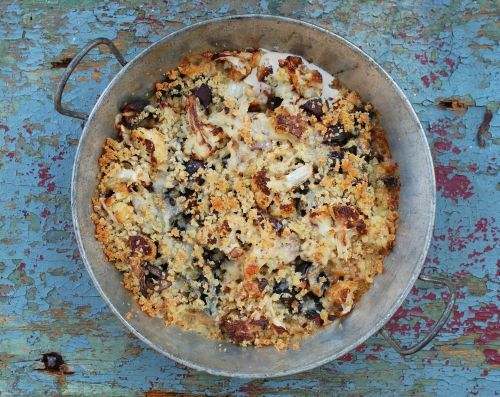 So after you roast your cauliflower, go to the beach. Or walk in the woods. Check out the leaves. It’s all delicious. 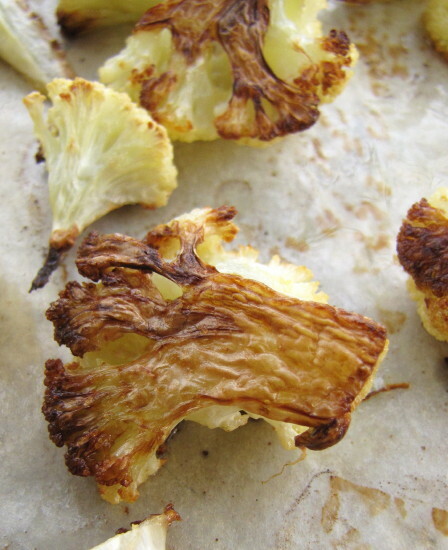 I love this high-heat, sheet-pan roasting method for cauliflower. But I recently roasted cauliflower in a Pyrex pan at 425 degrees, and it came out just fine, too. It does brown up and it’s still tasty. But there’s no doubt that the cauliflower (and most veg) gets crisper on an aluminum sheet pan at higher heat. Because of the material and depth of a Pyrex pan, vegetables roast a little more slowly and come out a bit moister (not always a bad thing) from the steam they pick up from neighboring veg. 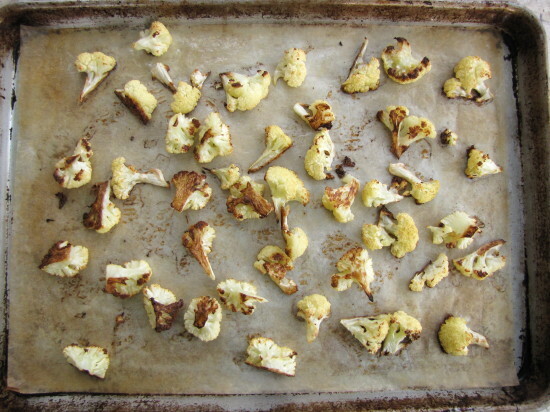 Since cauliflower has a fair amount of moisture to give off, it’s one that I think really benefits from the open sheet pan. Heat the oven to 475 degrees F. Line a large baking sheet with parchment paper. 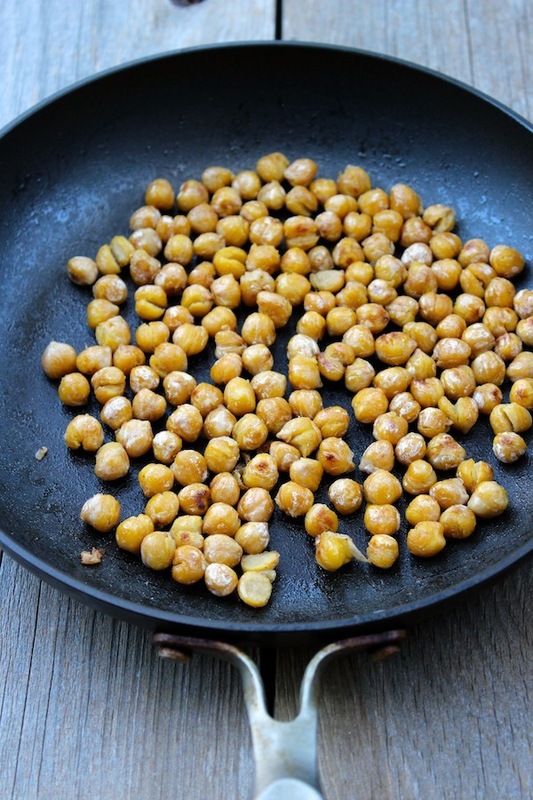 In a mixing bowl, toss the florets gently but thoroughly with the olive oil and salt. Spread the florets out on the sheet pan in one layer, flat side down. (Scrape any remaining salt and oil out of the bowl onto the florets). Roast until the bottom of the florets are well-browned and the tops are starting to brown, 20 to 24 minutes. (You can turn them once with tongs about ¾ way through cooking, but do leave the flat side in contact with the sheet pan for at least the first 15 minutes so that it will get nicely caramelized.) Serve right away (they cool down quickly), or drizzle with the butter and transfer to a serving bowl. To make Garlic-Lime-Cilantro Butter: In a small skillet, heat 1 tablespoon unsalted butter with 2 teaspoons extra-virgin olive oil and 1 teaspoon minced garlic over medium-low heat. When the butter has melted and the garlic has begun to smell fragrant, remove the skillet from the heat and mix in ½ tsp. freshly grated lime zest and ½ tsp. fresh lime juice. Stir in 1 tablespoon chopped fresh cilantro. Drizzle over cauliflower.